As World War II sinks further into history and people from that era begin to pass, one would think the interest in that period would wane exponentially. And yet, the one person from that time who continues to intrigue the world seems never to let go. Perhaps that is not a bad thing. In order not to repeat history, today’s generations should continue to learn from past mistakes. If there is any truth to that, then Volker Ullrich’s book Hitler: Ascent 1889–1939 is a tome of historical importance. 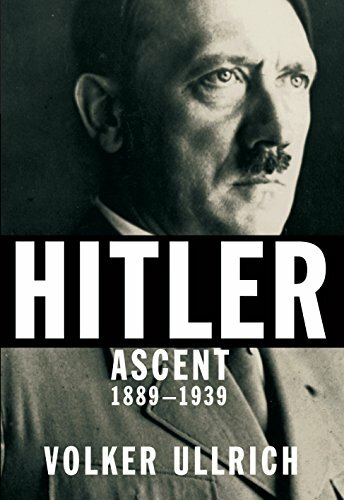 The first of two volumes, this takes us back to Hitler’s birth and educates us about his heritage, childhood, and growth into the man he came to be. For those who have studied this man, there may not be a great deal of new information from his childhood, but the details that Ullrich has pulled from various sources shed light on specifics of this entire era that may have been overlooked until now. Ullrich cites numerous resources including much from Mein Kampf as well as a variety of historical books, newspapers, and diaries kept by both public and private citizens expressing their excitement or dismay as Adolf Hitler began his meteoric rise in German politics. As a child, Hitler was very close to his mother. He was not exposed to poverty, having inherited a large sum of money from his Aunt Johanna when she died. He seems to have been a quiet, reticent child whose interest in art drove him to choose the path of an artist for his future. His rejection by the artistic community became almost unbearable. Ullrich exposes Hitler’s early artistic energies in the character of a daydreamer. The path laid out in Hitler: Ascent is very clear. Ullrich follows Hitler’s character from reticent to talkative to overpowering. Hitler’s time in the army during The Great War formed his political beliefs and sent him on the path to speaking out about what he perceived to be the devastating treatment of the German people at the end of the war. In particular, France became his mortal enemy, and everything French was to be hated. Many of Ullrich’s references come from the diary of Joseph Goebbels, one of Hitler’s closest aids. Goebbels wrote many observations that shed light on the period of the late 1920s and throughout the 1930s when Hitler climbed in politics and put his stamp on the National Socialist Party. Two of the topics Ullrich devotes considerable time to in addition to Hitler’s growth as a public speaker, politician, and leader, are Hitler’s relationships with women and his relationship with the church. Regarding women, Ullrich says “Hitler decided early on in life to forgo marriage and traditional family life.” That does not mean to say there were no women in his life at all, and Ullrich discusses several up to and including the most famous: Eva Braun. One of the earlier females in his life was Maria Reiter, a young woman 21 years his junior. Hitler preferred younger women, and he made no secret of it: “‘There is nothing better than educating a young thing,’ he would declare.” Strong confident women closer to his own age presented a problem for him. Although Reiter ultimately rejected Hitler’s awkward, clumsy approaches, they retained a relationship until she later married in 1930. Another younger woman in his life was his niece, Geli Raubal. According to Ullrich’s account, “None of the women in Hitler’s life fired the imaginations of . . . historians as much a Raubal.” Many historians considered her the only woman he really cared for, his mother notwithstanding. Raubal fell in love with Hitler’s chauffer, but when Hitler was confronted with their engagement, he fired the chauffer and effectively ended that romance. Other women drifted through his life, but concern about public opinion always kept them far in the background. Many historians have raised questions about Hitler’s sexual proclivities but have proven none of their accusations. Ullrich presents enough evidence to prove that Hitler’s sexual life was normal, perhaps with some extremes. The last woman in his life was Eva Braun. Her relationship with Hitler was kept out of the public eye from the very beginning, and little came around to change that, although in January 1933 she did attend a performance of Wagner’s Meistersinger. As their relationship developed, her influence with him grew, as did her power. Insight into the relationship with Eva Braun is outlined in detail in the chapter The Berghof Society and the Fuhrer’s Mistress. In one of the many interesting scenes he paints, Ullrich details the social setting of Hitler’s inner circle and Hitler’s half-sister, Angela Raubal (Geli’s mother), who ran the household in a no-nonsense manner. Raubal had no use for Braun, and attempted to convince Hitler to stop seeing her, but to Raubal’s surprise, it was she who was dismissed, not Eva Braun. This was certainly a turning point in Braun’s relationship with many others who felt she should be removed. Braun was by no means the dumb blonde observers long mistook her for. She was a modern young woman who knew quite well what she was getting in Hitler. Equally interesting is the chapter on Hitler and the churches. Hitler held a “deep-seated enmity toward Christianity. He wanted to subjugate the Churches to his will, . . .” Although he was raised as a Catholic, and he “maintained a lifelong respect for the power of the institution,” it was his desire to undermine political Catholicism in the world he was designing. “A treaty between the National Socialist government and the Holy See was drawn up on 8 July . . . [I]t prohibited Catholic clergymen from engaging in any kind of political activity . . .” Hitler saw this as an important fight against international Jewry. In his chapter on Prelude to Genocide, Ullrich quotes Hitler, “The final goal of our overall policy is clear to all of us,” as he shared his feelings about how to proceed again the Jews. He used his skill as an orator to stir up the emotions of his followers. Soon Jews were being forced to sell their business and flee. Persecution of the Jews increased at alarming rates in the form of discriminatory laws and anti-Jewish activities. One of the most vicious activities was a pogrom referred to as Kristallnacht or Reich Crystal Night. During the 3 days of November 7, 8, and 9, 1938, “More than 1,000 synagogues and prayer rooms were set on fire, and 7,000–7,500 Jewish businesses were ransacked . . .” In addition, “more than 30,000 Jews were arrested and taken to Dachau, Buchenwald, and Sachsenhausen concentration camps . . .” Hitler soon found that “nowhere was there vocal public protest “against the pogrom . . .” and so the action about the “Jewish question” moved forward with further, more extreme steps. Ullrich’s attention to detail during this period of Adolf Hitler’s life is exceptional. He brings Hitler and those around him, both supporter and foe, to life through his interpretation of the resources made available to him. If the second volume is as informative and interesting as the first, it will be a valuable collection for those interested in this era and those who are just learning about it.